Spooky City? Toronto Haunted Walk…Plus Halloween fun! We had ghosts on the brain after Ash shared stories of going on a Haunted History Tour in New Orleans recently. So, when a friend asked if we wanted to go on a Toronto ghost walk we were in! 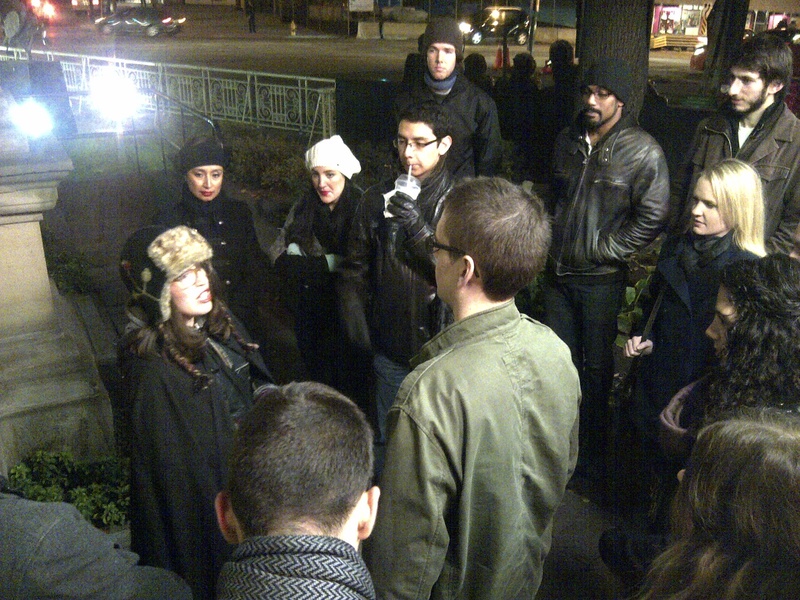 The two tours they refer to are Ghosts and Spirits of Old Town and Toronto’s Haunted Walk. The Old Town tour is completed in the Distillery District and St.Lawrence Market area while the Toronto Haunted Walk looks at downtown Toronto’s ghost stories and dark history. We chose the Toronto Haunted Walk as it would likely feature some locations we were very familiar with and was not limited to the Distillery. We purchased our tickets online for $18.75. Student tickets are available for $16.75, and children 6-12 years of age for $9.75. Tickets are also available 30 minutes before the tour departure on a first come first served basis. Our tour was set to depart from the front of the Hockey Hall of Fame at 9pm. We went the week before Halloween, so as you can imagine, there were lots of people. We initially wondered how all of these people would go on the tour, but they had a number of guides and split us into groups of about 18 people before departing. Tour guides all wore capes and carried lanterns. Nice touch. Our group was assigned a tour guide named Morgan. Morgan began by introducing herself and letting us know what we could expect on our walking tour. It would be about 90 minutes long and she would be sharing some ghost stories about the different areas that we were set to visit. She advised us to stay with her and be careful when navigating Toronto’s busy streets. Then, we were on our way. Morgan led us to a number of locations and told us ghost stories as we stopped. However, the stories were often vague and short and for some reason, we found it difficult to get into it. We also noticed that stories were often told about locations that we weren’t even standing at, often a building down or across the street. The “walking” element of this tour did not seem to sync up with the stories that were told and on this frigid night, it seemed like we could just have been told this stories in the warm indoors and nothing would have been lost. At one point, Morgan was telling a story about a church while competing with some very loud church bells. It was extremely difficult to hear, and the church the story was about wasn’t even the church that we were standing at …so there was no need to be there trying to hear her over all of the noise. Don’t get us wrong, the tour had interesting elements. There were some creepy stories about our city though, and although we don’t want to share too many and potentially spoil a future tour for you, here are some good ones. The St. Michael’s Hospital (which we didn’t actually walk to?!) has a number of hauntings by former patients and staff members. Vincenza is a former nurse who is said to haunt Ward 7b. She has been seen fluffing pillows of patients and walking the halls. Creepily, a black chasm is seen in the space where her face would be. Hauntings were described to have happened at Sick Kids Hospital as well. 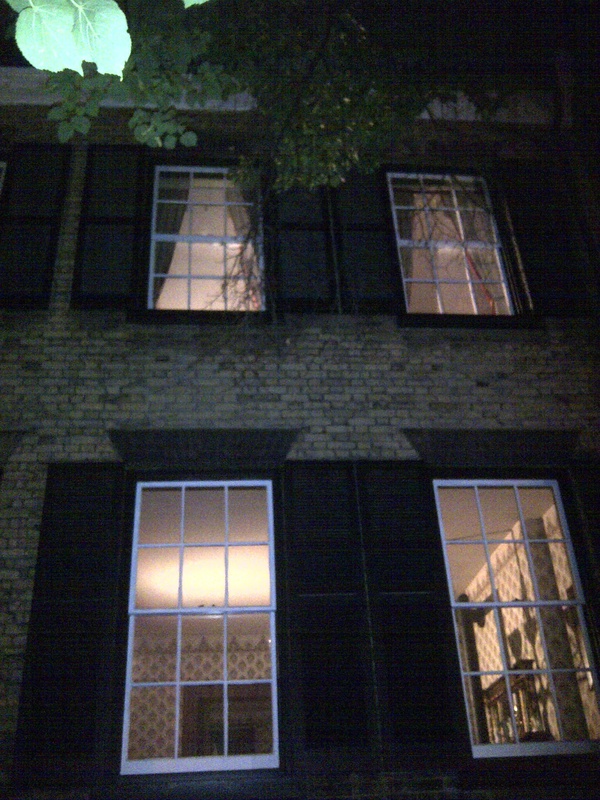 One haunted spot that we did visit was MacKenzie House. This is the restored home of William Lyon MacKenzie, Toronto’s first mayor. 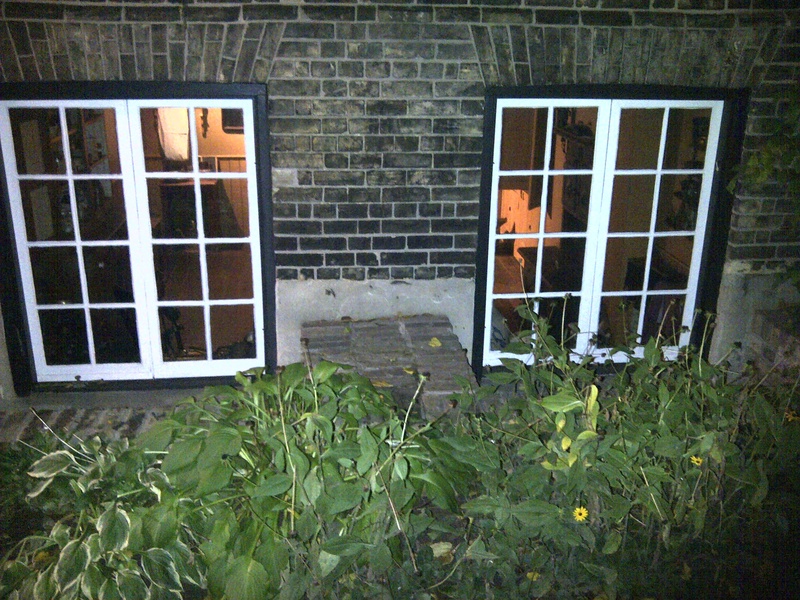 This is known to be the most haunted spot in the city, and possibly Ontario. We took lots of pics, hoping to see some orbs or any other marks of paranormal activity, like Ash did in New Orleans. Alas, nada. Morgan mentioned that their other tour actually gets to go inside of the MacKenzie House; this would have been a nice addition to our tour. One of our favourite fun facts from the tour was learned when we passed Old City Hall. The building was built in 1899 and designed by EJ Lennox. Lennox was told that he was not able to leave some kind of signature on the building because he had already gone over budget. So, what did Lennox do? 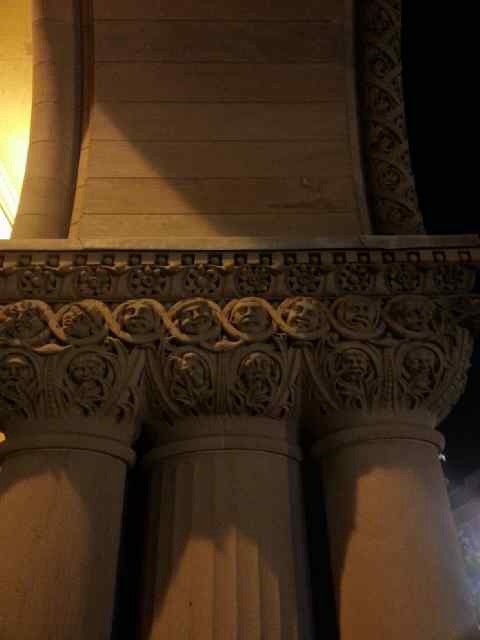 He carved a likeness of his own face amongst other politicians of the time into the building. We like his style! We probably would not hurry back to do another tour from this company, we might try another in the future. While we learned some neat things about Toronto history and hauntings, the tour ultimately fell flat, in our opinion. Still, it made for a fun pre-Halloween outing. Speaking of Halloween, would you like to have a peek at our costumes this year? 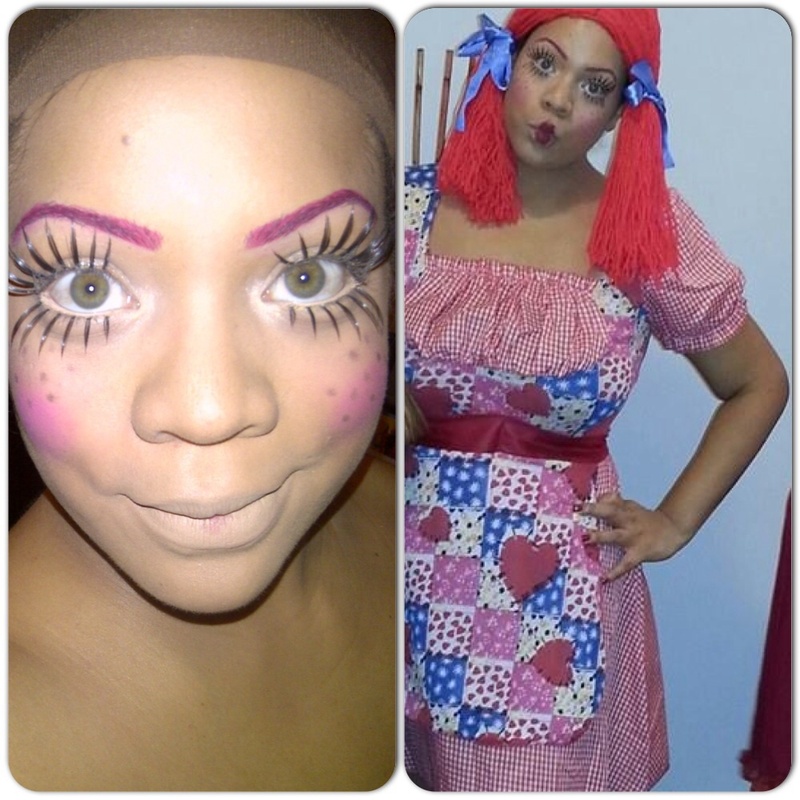 We love to play with makeup and Halloween is an amazing opportunity to go all out and have fun with this. Meet Raggedy Ash. 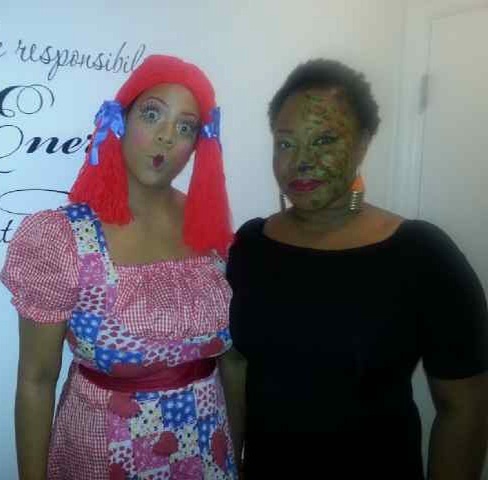 Ash had fun doing doll face makeup and donning a red yarn wig. How fun are the lashes?? 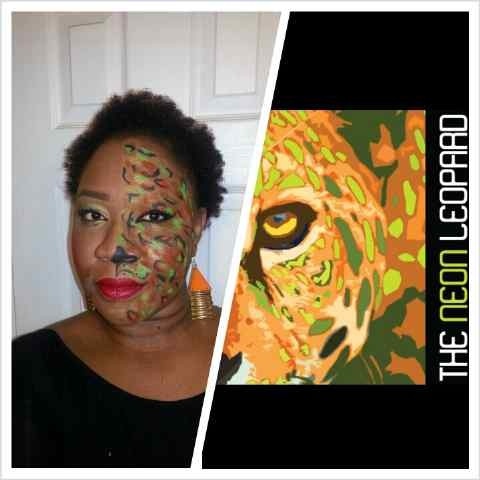 And, here we have Chris bringing our logo to life as a real life Neon Leopard! We had so much fun getting “dolled” up and going “on the prowl”! We hope that everyone had an amazing Halloween and if you have ever been on a haunted tour or know of some creepy Toronto ghost stories, please share below! It is very strange that the tour’s stories didn’t match its locations. Of course most tours necessarily tell you about more than just the stories and facts that relate directly to your location but they usually are based on, or prompted by, where you physically are…isn’t that what a walking tour is all about? Great review – and very accurate too. The Haunted Walk was definitely not as spooky as I expected, and I was also disappointed that the locations the tour guide talked about did not match the places we actually went. It was, however, fun to be out and about near Hallowe’en with friends, so it was not a waste of time by any means…and I agree, after going on a haunted tour in NOLA, probably every other one pales in comparison. The costumes were fantastic!!!! Too bad the stories didn’t match…I found that in Quebec City only half the stories matched to the locations where we were but it was still very enjoyable. I’m the biggest chicken ever I could never do this late at night, although it’s a pretty cool idea!